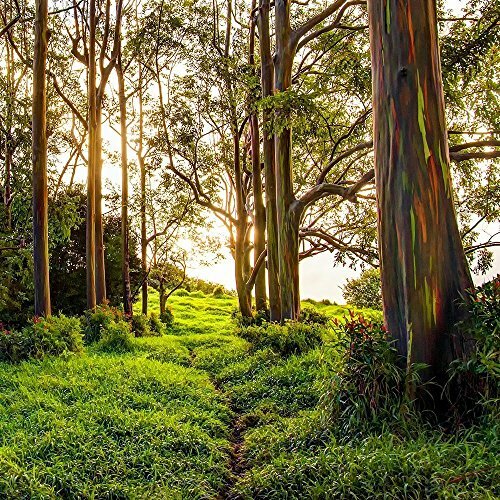 Title: "Rainbow Eucalyptus Trail" Call them psychedelic or Earth's environmental graffiti, the Rainbow Eucalyptus (Eucalyptus deglupta) is one of the most colorful trees on earth. Their striking colors of red, orange, yellow and green are most vibrant after a rain storm or on an early morning misty walk. You are buying a ready to hang aluminum metal print, available in sizes 24x24, 30x30 and 36x36 inches. Please use the "Select Options" menu for sizes. Aluminum metal prints are uniquely durable prints with vibrant colors that pop out into the room. This is a high quality print that is created by infusing archival inks directly into a specially coated aluminum panel. Since the archival inks are infused into the aluminum panel, the image depth takes on a stunning and striking appearance that truly brings photography into the high defintion era. The artwork is ready to hang with an inset aluminum hanging frame and wire hanger on the back. This unique hanging system makes the print appear to float off of the wall for a clean contemporary look. The print's ultra-hard, scratch-resistant surface is waterproof/weatherproof and can be easily cleaned with a microfiber cloth. Aluminum metal prints are extremely light in weight, making them very easy to hang. The corners are smoothed and slightly rounded to avoid sharpness. If you have any questions about this product by Maui J & M Photography, contact us by completing and submitting the form below. If you are looking for a specif part number, please include it with your message.